As a vehicle with rear leaf springs comes under load the factory springs react as they are designed too. The center of the springs move vertically causing the overall leaves to flex and “flatten” out. This movement in the factory spring activates the SuperSpring through the rollers at the end of each leaf. Because the SuperSpring rollers are under tension, a movement in the factory spring causes them to move, seeking their new point of least resistance. This simple roller principal allows the SuperSprings to activate and deactivate automatically, free of any manual adjustment. 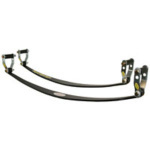 The SuperSprings are length specific to fit varying sized leaf springs. In addition the different lengths typically are manufactured in light, medium and heavy duty strengths. The sole adjustment on the SuperSprings is found in the roller shackles at the end of each leaf. The typical shackle has two bolt holes, as shown in the diagram below though some single hole and three holed shackles are used. The most common installation involves positioning all four rollers in the lower (furthest from the eye of the SuperSpring / closest to the ground) bolt holes. This ensures the least amount of preload tension on the SuperSprings and keeps the vehicle closest to its original factory ride conditions. Upper bolt holes may be used if additional “lift” is desired in the vehicle; if clearance from obstructions is required or if the installation is on an older vehicle with some fatigue in the springs. SuperSprings enhance load carrying capacity, handling and towing. Do not load any vehicle beyond the manufacturer’s gross vehicle weight rating.